As the holidays are in full swing, let’s try to eat healthy when we can. After all most of this season is spent eating out, eating at holiday parties, not to mention huge family gatherings. During the few moments when we are alone this season, why not give your stomach a break and have something light. When I need something light, yet filling, I turn to tofu stir fries. Many people can find tofu to be bland, however this is the best part of tofu! You can infuse any flavor you’d like into tofu and have a great flavorful meal! 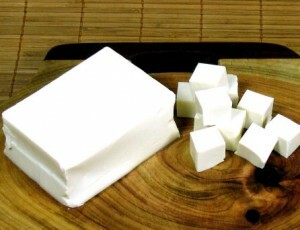 Low in fat and calories, tofu is great baked or in stir fries. 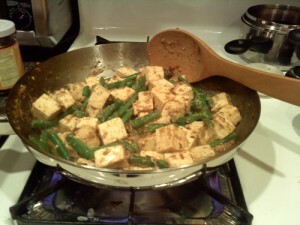 Enjoy this simple and quick recipe for a green bean tofu stir fry. Gently dry of excess moisture from the tofu by blotting with a paper towel. Evenly cut the tofu into two sections. Place sections on top of each other and cut into fourths horizontally, and then cut into fourths vertically. You should have 32 cubes when done. This entry was posted on Wednesday, December 16th, 2009 at 9:06 am and is filed under Recipes.